Letter of credit. A document issued by a financial institution that provides a promise of payment for a trade transaction, implying that it can be redeemed if certain conditions are satisfied. They are mainly used in international trade for transactions between actors, such as a buyer and a seller, in different countries. Bill of lading. A document that establishes evidence and the terms of a contract between a shipper, a transportation company and the agents providing and receiving the cargo. It serves as a document of title, a contract of carriage and a receipt for goods. A buyer and a seller agree upon a transaction through a contract that specifies price, quantity, time and place of delivery. Then the buyer will contact its bank to have a letter of credit issued with the seller as beneficiary. This letter of credit can either be funded by a loan and simply debited from the buyers account balance if sufficient funding is available. If a loan is used, it is subject to standard underwriting procedures involving a down payment, a line of credit and interest rate based upon the buyer's credit worthiness. Insurance is commonly required as a condition to issue a letter of credit so that various risks, such as damage and delays, can be mitigated. The bank commonly levy a fee ranging from 1 to 8% of the transaction, depending on its value and complexity. With the letter of credit the seller now has a line of credit available at its bank and final payment will be made once the delivery conditions of the contract are satisfied. The seller can then provide the consignment to a shipper in exchange of a bill of lading promising that the consignment will be delivered at the agreed destination. At this point the consignment is handled by the transportation system and can involve the usage of port facilities, warehouses, rail or trucks segments depending on the concerned transport chain. The seller can then present to bill of lading to its bank as an additional condition being meet to secure final payment. It is important to underline that payment is not necessarily provided to the seller immediately after the bill of lading is provided, but after the buyer has taken ownership of the consignment and confirmed that it meets the specification stated in the contract (quantity, quality and condition). 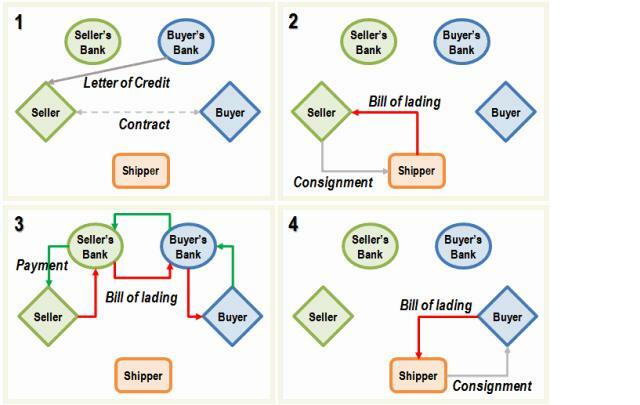 The bill of lading is then forwarded to the buyer's bank in exchange of payment and afterwards to the buyer so that the consignment can be claimed once delivered. The buyer is finally able to provide the bill of lading to the shipper and claim the consignment. After it has been confirmed, often by a neutral third party, that the consignment meets the terms of the contract the seller can claim final payment from its bank from the funds that were previously deposited. It is estimated that large commercial bank finance about 90% of all global trade transactions. If for any reason the letter of credit cannot be cleared and payment made the transaction cannot take place.